From last 6 years, actress Renu Desai has settled down in Pune with her kids from first husband Pawan Kalyan. Going by this, none will ask her if she is going to vote in Hyderabad or in any other Telugu state. But one wonders what is Renu trying to tell with her Instagram story. Currently holidaying in Bali with her kids Adya and Akira, Renu is said to have received a lot of messages on her Instagram account to go and vote in the election. Naturally, the former wife of Pawan hasn’t revealed who asked her to go and vote in the specific, but many are busy pointing fingers at Pawan Kalyan’s fans only regarding this. 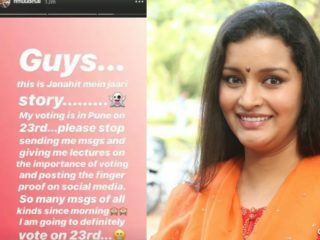 And in her Insta story, she added, “My voting is in Pune on 23rd. please stop sending me msgs and giving me lectures on the importance of voting and posting the finger proof on social media. I am going to definitely vote on 23rd”. Celebs of all kinds naturally get such demands of inked finger selfies, but isn’t this a bit harsh on Renu to respond this way? On the flip side, some netizens advised her to do a digital detox as well, as to why she’s busy checking her Insta messages on a holiday rather spending good time with kids in Bali, Indonesia.